Anand proves more than happy to play both sides of the Ruy Lopez, coming up with another positional gem against an interesting opening idea from Grischuk. Anand ponders 1. f4....but waits for move 29. 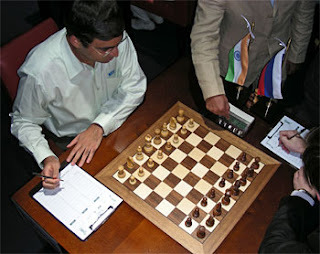 All other games were drawn in this round, reestablishing Anand as the sole leader at the halfway mark at +3.